Please click on the cover above for more information on the book and to buy and download immediately to your #Nook, #Kindle, #PC or #Mac. 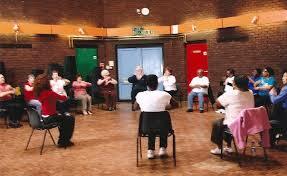 Welcome to the Chair Tai Chi Blog! 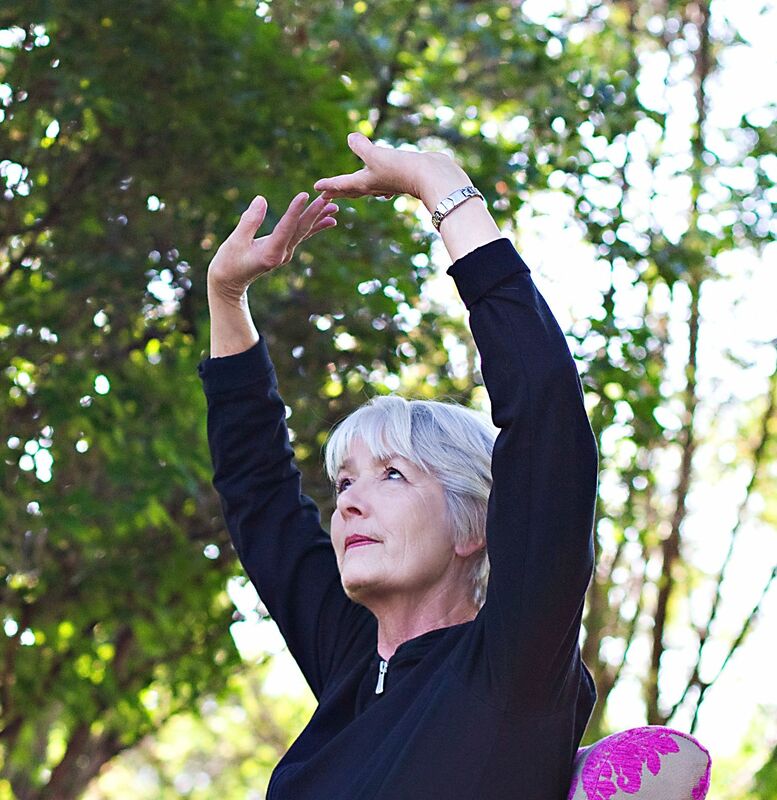 Below is a video of a short series of seated exercises that is easy to follow and will help you to energize and stretch while sitting comfortably. Please click on the link below to access the video. 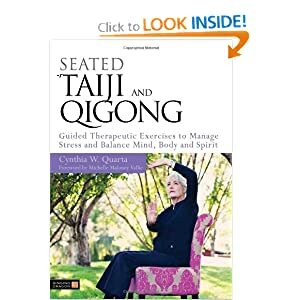 If you have a favorite video of gentle seated or standing exercises, please send it with a short explanation of how you use the exercises to healingtaichi@yahoo.com with the subject line, “chair tai chi blog.” We’d love to know what you do to stay fit. 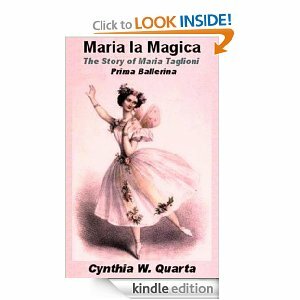 For more information and to order this ebook through Amazon, click on the link below. For further information and to order from Barnes and Noble, click on the link below. Sit as usual with your feet flat on the floor, legs shoulder-width apart, back fully supported by the back of your chair. Take 6 to 12 slow, calming breaths in and out through your nose. Place the fingers of both hands on the back of your head. Locate the depression beneath your skull about one and a half thumb widths from the large muscles on either side of your spine. Rub the two areas for at least a full minute and then hold your thumbs firmly on these spots for another full minute. Note: This exercise is both a massage and an acupressure point called the Gates of Consciousness (GB 20). Frequent use of this point will benefit you in many ways. It serves as a relief for sinus pressure, headaches and allergies but it also alleviates depression, emotional distress, and feelings of grief. The Chinese identify 20 meridians that carry energy to all parts of the body. Of those 20, 8 of them are considered to be “extraordinary” because they function as storage areas of chi. These extraordinary meridians replenish the others as needed. Welcome to Healing Tai Chi ! This book is available from Barnes and Noble in print or from Amazon in both print and ebook format. It’s that time of the year again – stuffy nose, headaches, sneezing, coughing and teary eyes. The next few exercises and acupressure points will provide at least a bit of relief from the symptoms of seasonal allergies. Sit as usual with your feet flat on the floor, shoulder-width apart with your back supported by the back of your chair. Change hands and hold your left nostril closed a breathe out slowly through your right nostril. Continue breathing in through your left nostril and out through your right for about 6 times. Now, hold your left nostril closed and breathe in slowly through your right. Then, change sides breathing out slowly through your left nostril for the same amount of time. 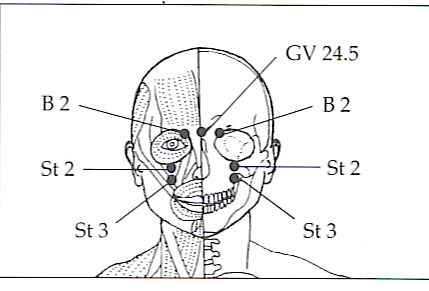 Locate the acupressure points labeled B 2 on the illustration above from Michael Reed Gach’s book, Acupressure’s Potent Points. They are at the indentation of the inner eye socket where the bridge of the nose meets your eyebrow ridge. Press firmly on these two points with your thumbs for no less than a full minute as you breathe in and out slowly through your nose. Benefits: These effective points will relieve hay fever, sinus pain, blurry vision (caused by sinus pressure), and headaches. There are 11 famous Chinese medical books that have survived from ancient times. Perhaps the best known of those books is the Yellow Emperor’s Classic of Medicine. 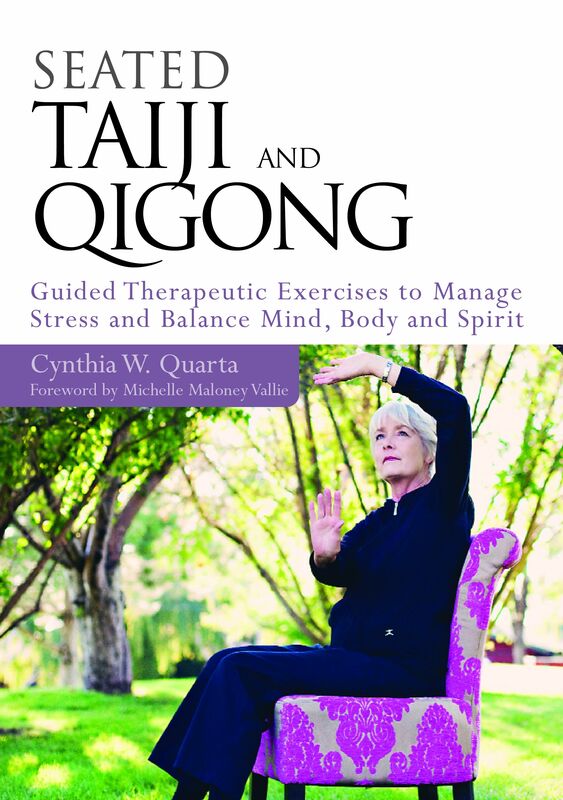 This classic book lays out the foundations of traditional Chinese medicine (TCM): the theory of balance (yin/yang), the five elements, the concept of holism, and a description of the meridians, organs, emotions and pathogens. 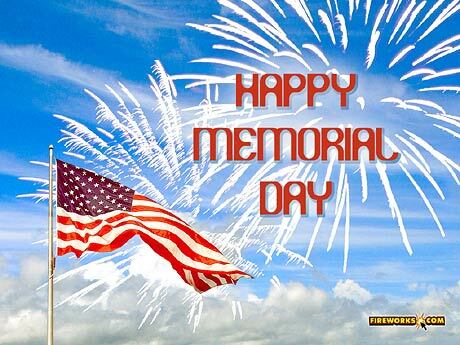 We hope you and your family have a happy Memorial Day even as we remember our family members and friends who have passed on and the men and women of the Armed Forces who sacrificed everything to protect our freedoms. We will be back next week with a new exercise and acupressure point for arthritis. This week we’re going to return to the side to side head tilts with the addition of head circles clockwise and counterclockwise. Be very careful particularly when you are doing an exercise that involves the neck. Move slowly and pay attention to the breathing to ensure that you don’t strain your neck. As always, consult your health care practitioner before beginning any new exercise. It is especially important in this case if you have had a recent injury to your neck or have had surgery on your neck any time in the past. Sit as usual with your feet flat on the floor, shoulder-width apart. Make sure that your back is fully supported by the back of your chair. Breathe in an out through your nose slowly and thoughtfully about 6 to 12 times before you begin. Begin by breathing in through your nose. Then as you breathe out, lower your head toward your right shoulder. Continue circling right to left for a total of 6 circles. 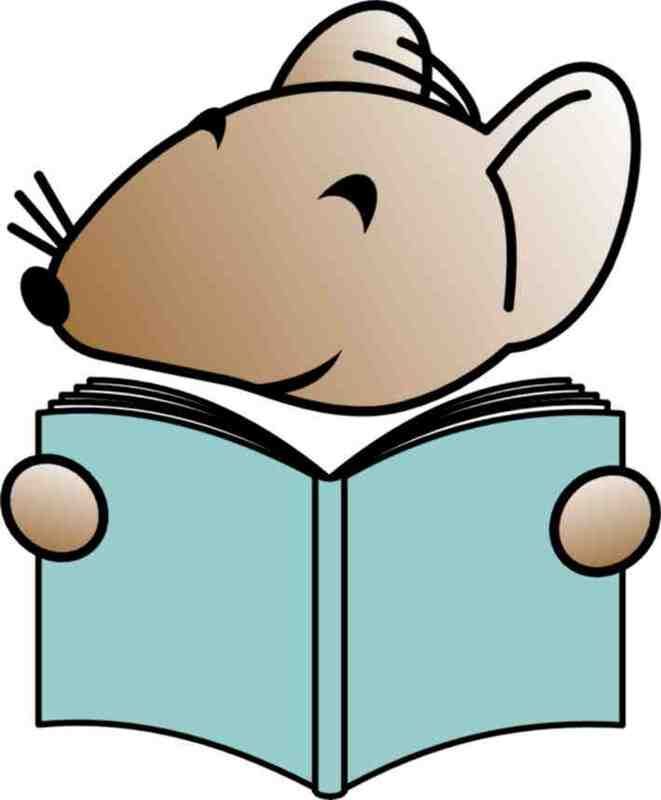 Now, let your head tilt toward your left shoulder and circle left to right or clockwise. 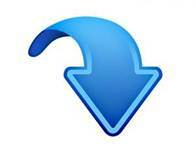 Breathe out as you tilt and begin the circle then breathe in as you return your head to the upright position. Continue circling for a total of 6 circles. 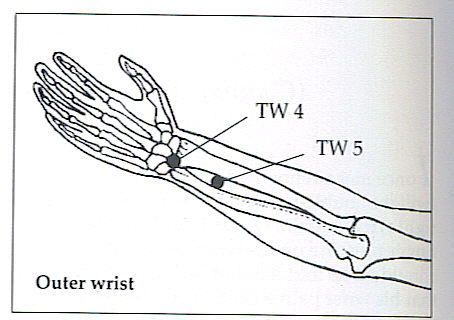 Locate the acupressure point labeled TW 5 on the illustration above from Michael Reed Gach’s book, Acupressure’s Potent Points. Press firmly on this point that is located about 2 1/2 finger-widths above the wrsit crease on the outside of the forearm midway between the two large bones of the arm. Continue pressing on this point for no less than a full minute. You may change arms and repeat the firm pressure on the Outer Gate for the same amount of time.